888 Tron platform has launched on the Tron Network during December 2018. It promises to revolutionize the gaming industry with a new concept of revenue share model. 888 Tron provides its first users with a unique opportunity to not only play games and win, but also to become co-owners of a very profitable business. The platform is public and seeks to change the traditional approach to managing business in the gaming sector. Essentially, by using the 888 Tron platform, users will be able to own 888 Tron tokens and will thereby be the owners of the platform. Tokens can only be obtained by those who play games using the platform. The platform’s profits are intended for even and transparent distribution among token holders through a smart contract. Dividends will be paid in TRX cryptocurrency, which is a common cryptocurrency, traded in most cryptocurrency exchanges. The games in the 888 Tron project will be anchored on well-designed mathematical models and high winning percentages. The dice 52 game provides players with a unique win chance of 96.15%. Moreover, the games will be very unique and token holders can be assured of stable and predictable incomes. The first users of the 888 Tron project will play games and get the platform’s tokens anonymously. The platform will allow for fair play, equal conditions for obtaining tokens, and a fair and transparent mechanism for distributing dividends. The supply of tokens in the 888 Tron platforms is limited at 100,000,000 tokens. Tokens in the platform can be mined by betting. The process of mining is divided into levels, with each level limited by time and only lasts 48 hours. At each level players can mine an unlimited number of tokens. To mine one 888 token, the minimum starting bet is capped at TRX 700. After each level is passed, the minimum bet to mine one 888 token will increase by TRX 10. So if for the first level a player uses TRX 700 to earn one 888 token, for the nest level of mining, the player will need TRX 710 for one 888 token. For the third level, it will increase by 10 TRX 720 for one 888 token and the trend continues. 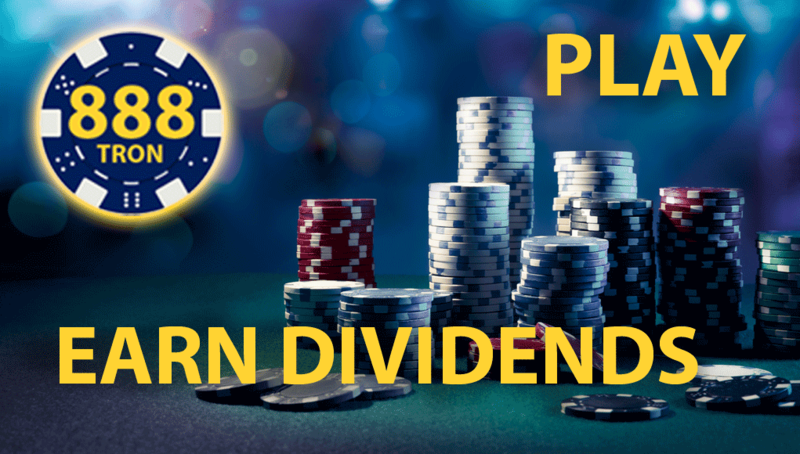 Players of the platform will be paid dividends at the completion of each mining level of the platform-every 48 hours. The dividends are paid in TRX cryptocurrency among all 888 token holders who froze their tokens on smart contracts before the end of current mining level in proportion to the number of tokens that have been mined and frozen. Once the process of mining is complete, dividends are distributed automatically once every week. For example, let’s assume you have a 1% of the total volume of the platform’s tokens. And say the platform’s income for the reporting period has amounted to TRX 30,000,000.You will therefore receive TRX 30,000,000 *0.01 =TRX 300,000. There are 12 million TRX dividends to be earned in the first mining stage. At the moment there are 10 million TRX with each day raising 1 million TRX dividends which will finally translate in TRX 12 million. During the mining process, each token mined brings a reward in the amount of 0.5384615 of the token to the team, partners and reserve fund. At the completion of mining, all platforms’ tokens will be distributed as: players mine tokens-65%, team tokens-20%, advertising -10% and technical-5%. Once 30% of the tokens have been mined, 888 token will be listed on the decentralized cryptocurrency exchange and exchanges specializing in security tokens. The listing process will be subject to agreement between the token holders to avert a fall in the value of the token. 888 Tron involves cryptocurrencies and token mining. Players participating in token mining and games on the platform should consider their local laws and regulations to avoid violations. For more information you can read the whitepaper or join the telegram group.